Øresundtåg, run by DSB in Denmark and Transdev in Sweden, is modernising its ET/X31K electric trains after 15 years in service. The trains were the latest generation of the IC3 family of trains, built for the regional traffic across the Øresund bridge into Danmark and Sweden. Øresundtåg is showing its first updated ET/X31K train at the stations in Malmo, Varberg and Vaxjö from 7 until the 10th of March. Both the interior and exterior had a major make over. All 111 trains will be overhauled in the next 5 years. Prior to the overhauling, staff and passengers were able to comment and request changes to the trains. Several requests were tested in a “test train” and again open for comments. 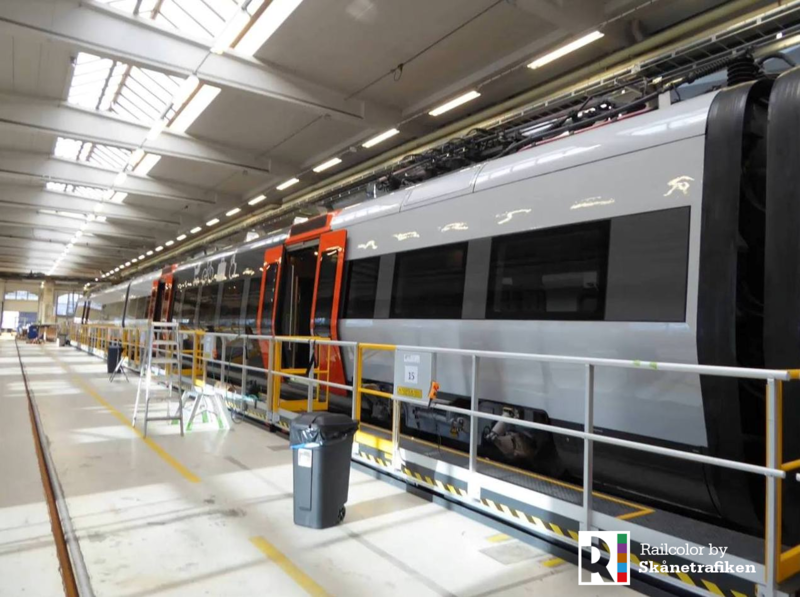 Swedtrac RailServices AB, a Knorr Bremse company, is assigned to overhaul the 64 Øresundtåg trains with an option to overhaul the other 47 train sets as well. The trains will have a new exterior design. The doors of the middle carraige are marked red. The low floor section between these doors has a dark grey color with clear markings to easily find your way around the train. Both end carriages have dark gray doors with a vertical red line. The electric trains share cab and front with the Danish IC3 trains (with Jacob bogies), although they are a part of the Regina train family (with 2 bogies/carriage) and were built by Bombardier in Kalmar (Sweden) and Henningsdorf (Germany). Bombardier named them Contessa. They will run on both Danish (25kV 50Hz AC) and Swedish power (15kV 16⅔Hz AC). The class is designated ET in Danmark and X31K in Sweden The ‘K’ in the Swedish class designation means it’s allowed to go to Copenhagen. The chassis is manufactured of stainless steel. Half of the the trains is owned by DSB, the other half by Transdev. The middle of ihe train has a space for many needs. Here wheelchair users share space with prams and bicycles and extra luggage can be stowed here. 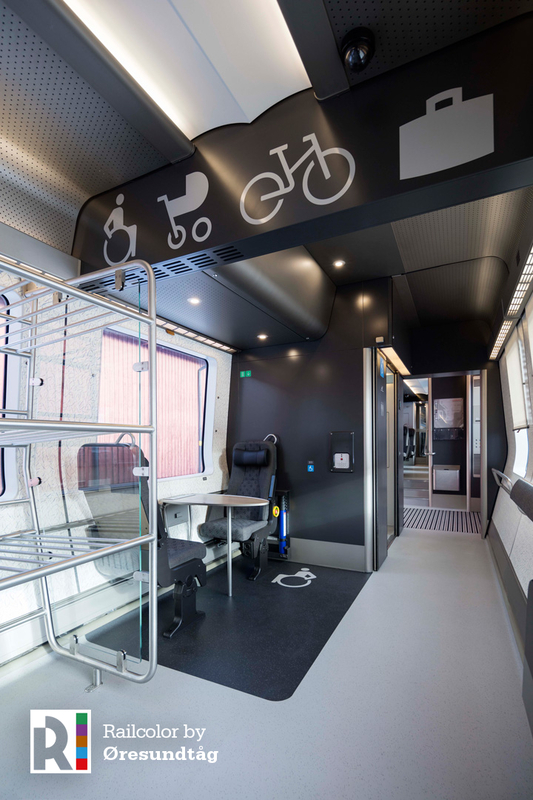 To make travelling more enjoyable for wheelchair users, a seating area has been created to sit with friends. The space also houses a large luggage rack. Clear markings in- and outside the train make it easy to find this department in the train. The updated train has 2 classes: First and Second Class. The carpets all have been changed, clear markings in the floor show where larger bags can be put, between the backrests of the chairs. The chairs have new padding, new textile in Öresundtåg design and newly painted chair frames. Each seat has a power outlet for charging mobile or computer. A part of the Second Class is a quiet department for relaxing or concentrating. No need to listen to other people’s mobile phone conversations or discussions. A pleasant image from one of Öresundtågs destinations increases the harmonious atmosphere. A fabric mat replaced the plastic mat to dampen the volume of sound. Again clear markings on the outside and inside of the train show where to find the quiet department. The trains have got fresher, more reliable, environment friendly toilets. Öresundståg introduces a new environment in First Class also. With comfortable folding chairs for work or rest. An small office that moves through the landscape. New tables accompany the new seats. Working is made easier for those who want to work with a computer on board. Again each seat has its own power outlet to charge your mobile or computer. Like the quiet department in Second Class, a picture from one of Öresundståg’s destinations features at the end wall. 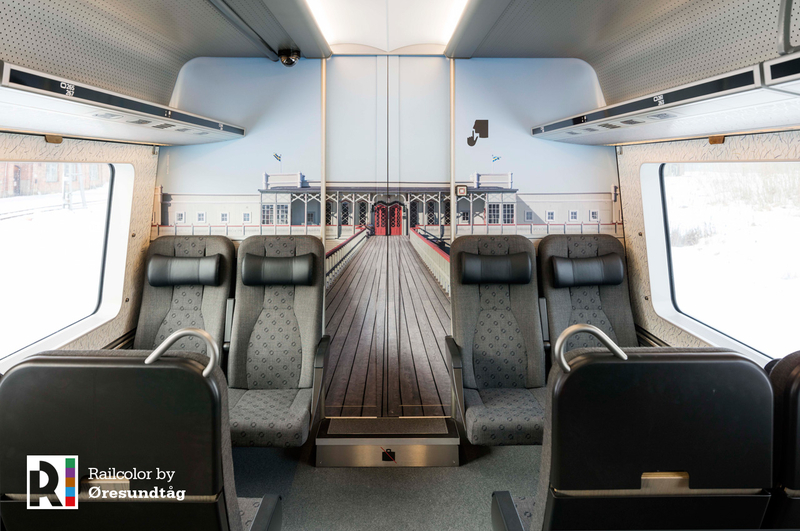 Öresundtåg makes passengers expercience the updated interior through virtual reality. You can have a look too, click the picture below to visit the virtual tour. Watch the video (in Danish) by Kennys flim of the presentation of the new Øresundtåg in Malmö on 7 March 2018. Kenny also had a look inside the overhauled ET/X31K train.